We all appreciate a good cup of coffee and to get it, we try to find the best equipment within our budget. But with low-quality coffee, you still won’t be able to enjoy great coffee. But what is the best coffee? Which coffee companies should you choose? Is there a difference between the coffee roasters? With an online coffee subscription, you can answer all those questions yourself! So why to join a monthly coffee club at all, you may ask? Well, in my case it’s simple: I don’t know what I like. Do I like a light roast or dark roast? Coffee from South America or rather Africa? Full-bodied or medium-bodied? More the citrus flavors or chocolate? I am at a loss because the selection is just too big. What I know is that I want freshly roasted coffee, not the stale coffee from the shelf anymore. If you experience the same, you should definitely consider an online coffee subscription. Disclaimer: The min. and max. prices, free shipping, and all other offers are subject to change and are not guaranteed. You pay the price that is offered at the club and not what is stated in this post. Bean Box offers a selection of freshly roasted coffee from the top roasters of Seattle. It’s important to get the roasted coffee in a short time to conserve freshness and the unique flavors. That’s why they ship it within 48 hours of roasting. You can expect your delivery within approximately 3 business days. Bean Box has many different coffee subscription boxes to offer. Most of them come with free shipping. It’s a great gift idea for a loved on. 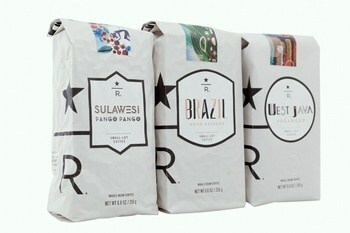 Of course, you can also taste the 4 sample bags of single origin coffees from local roasters yourself. Or you can select the Coffee Of The Month plan. You receive a 12 oz bag of coffee and can choose between monthly, biweekly or even weekly delivery! It's worth to mention that the more often you order the bigger your discount (15% with weekly delivery, for example). 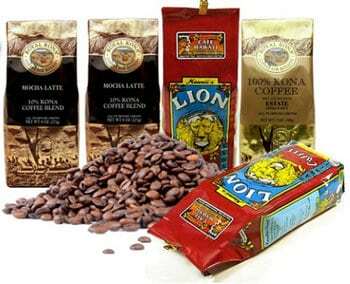 With Bean Box, you can choose from a variety of coffee gifts from all over the world. Those gifts should brighten up even the pickiest coffee connoisseur’s mornings. If you or your loved ones prefer a specific origin, be Bean Box’s guest! Choose your next coffee from Latin America, Africa, or why not Indonesia? There’s even a Decaf Sampler for the ones who shake too much after a caffeine boost. The value, especially for the sampler subscription, is kinda low for the price you pay. 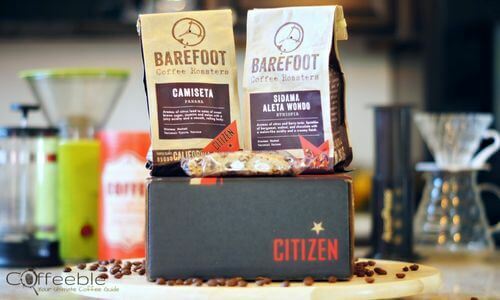 Citizen Bean is one of the originals of online coffee subscription services! On the market for several years they know what they do. You should know, that Citizen Bean was so kind to send me a free box to test drive their subscription plan. But I can guarantee you If I didn't like what they do or didn't want to subscribe to their service myself for whatever reason I would not include them! Citizen Bean offers two different subscription plans. One option is for the espresso lover only. You get ​two 8 oz bags of espresso beans for your espresso shots or cappuccinos. The second option is a selection of single origins. These coffees vary in country of origin and roast types. Whether you choose the espresso or the single origin plan, your coffee beans are guaranteed to be Fair-Trade Certified, Organic or Shadow Grown coffees. Citizen Bean also sources from farmers that work within the direct trade model. The package also includes some extra helpful or unexpected goodies. A How To Guide for the recommended brew method, a bean profile of the roaster, or some candy, just to mention a few. How They Set Them Apart? Citizen Bean donates a portion of their sales to a charity of their choice! I love that! At a time when profit is mostly the only corporate's success indicator, I can't describe how much I appreciate the effort of supporting the one's in need! Another distinguishing feature is the amount of coffee shipped to you! Instead of a typical 12 oz. bag, with Citizen Bean you get 16 oz. of pure coffee enjoyment in one shipment. In the box you will find two 8 oz. bags of different coffee origins. 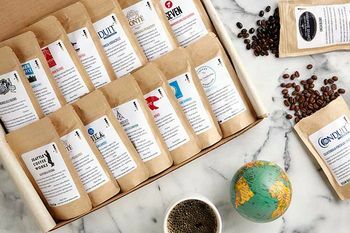 And if you decide to join Citizen Bean's coffee club for a whole year, you can choose either 3 months of free shipping or their welcome kit for a ​60% discount! What You May Not Like? Citizen Bean does not offer free shipping with the small exception mentioned above. You cannot order coffee by a specific roast type or grind size. Citizen Bean always ships whole beans and includes a random selection of light through dark or espresso roast coffees. 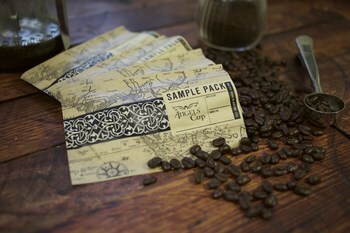 Angels’ Cup ships samples or full bags in a nice coffee subscription box. You can choose from a selection of over 50 roasters. I enjoy their way to provide a small profile of the coffee beans. You can get detailed information about the roasters, the farms, and why Angels’ Cup has favored them. The Cupping Flight includes four 1 oz samples and each sample will make about 16 oz of coffee. The Black Box ships with four 2.75 oz samples and for each sample you will get about 44 oz of brewed coffee. If you want, you can blind taste test both boxes. The two boxes come with neutral bags marked with a number to identify them afterward. The Angels’ Cup All Stars is for the ones who want more than just to taste test a cup or two. You’ll receive one 12 oz bag of freshly roasted coffee beans shipped straight to your front door! Angels’ Cup offers a smartphone app that takes you to another level of coffee indulgence! It doesn’t matter if you are a novice or expert. Tracking your cupping experiences: a child’s play with this straightforward app. You can compare your results against the Angels Cup community or the roasters themselves! The price for the sampler subscriptions may be too high for you if you want to drink more than a cup every other day. Crema.co is a little different compared to the prior mentioned subscription services. They currently don’t offer small sampler boxes but only the full 12 oz bag of freshly roasted coffee. What I appreciate is the way how Crema.co presents their coffees in an enchanting way! You can find a lot of detailed information about the farmers and the roasters. Pleasant images make your virtual journey perfect. It’s almost like you are turning pages in a family photo album. With Crema.co, you can choose between several coffees from all over the world. Prices range from $15-$18 per 12oz. The subscription is like the Netflix DVD queue, as they explain on their website. You browse through all available coffees and add your favorites to your list. Choose the frequency of delivery and then get one at a time and start again from the beginning. Or you can sort the coffees by roast type or geography. There is even a filter for certifications to only see coffees that are for example organic. No sampler subscriptions are currently available. In addition you can only choose whole bean delivery. Crema now offers samplers as well! So there's nothing to not like about Crema.co! Bizzy Organic Cold Brew Coffee Concentrate – What’s All The Buzz About It? Are you asking yourself why the heck I'm comparing Barista Coffee Box with a Steak House? Fair point! If you have never been to a Brazilian Steak House before it works like this: you go in, sit down, and the server walks by with skewers of meat and is cutting off little pieces of filet mignon here or slices of rib eye there for you to sample. Barista Coffee Box is about the same. But instead of meat, you can sample small amounts of gourmet coffee. Every month Barista Coffee Box ships (for free) a new roaster's selection of four 2 oz coffee pouches to your front door. Light roast, medium roast, African or South American Origin, fruity, chocolaty, citrusy, you name it. So if you have no idea whether you're a light roast or dark roast coffee drinker, this is a great coffee delivery service for you to develop your coffee palate. And best of all: you will get to know micro coffee roasters, that you probably would have never discovered yourself. 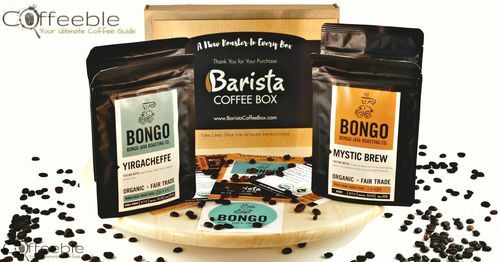 Barista Coffee Box ships 4 x 2 oz pouches of coffee every month from different roasters. Each coffee has its own I.D card which includes country of origin, expected flavors, roast type and often a discount code when you're ready to order a full bag. Barista Coffee Box gives you the option to try samples of coffees from small coffee roasters you may only be aware of if you live in the same city. The samples usually include a wide variety of coffees for you to find your preferred type. The price for what you get is pretty high. But other coffee delivery services charge the same or even more for samples. So basically it's just what you have to pay for the convenience of automated coffee sample delivery. The Hawaii Coffee Company offers 100% Kona Coffee. Don’t mistake them with the cheap Kona Blends you get from the store! Those typically contain only the least required amount of 10% Kona Coffee. The rest is cheaper coffee from other countries. 100% Kona Coffee is quite expensive because it only grows in the Kona district on the Island of Hawaii. You can sign up to the 5 Bag Mix & Match Coffee Club and choose from different packages. The cheapest coffee subscription box includes 5 bags of Kona flavored coffees or blends. And remember, Kona blends are mixed with other coffee beans. For a whopping $40 per pound, you can join the 100% Kona coffee club. But I did a research and indeed high-quality Kona Coffee is expensive! The Hawaii Coffee Company offers 100% Kona. They also have 100% Peaberry Kona in stock, which is even more expensive. If you are a new customer, you also get a free bag of coffee when you sign up between November 1, 2015, and January 31, 2016. According to their website, you have to call to join their coffee club. Coffee.Club is a family run business. You will find handwritten notes and extra treats in your bag. The Coffee.Club family says they want to make sure you are also treated like a family member. Roasted by hand is one of their coffee’s characteristic. It means the roaster controls heat and air flow to enhance the flavors and aromas. Coffee.Club’s coffee is organic and fair trade. Shipping takes about one week from the roasting facility to your front door. As a member of the Coffee.Club you can choose between light, medium and dark roast. Both light and dark roasts are single-origin. The medium roast is a blend of two single origins from Central America and East Africa. The coffee bags come in typical 12oz bags. The Coffee.Club offers a free Keurig compatible cup. So if you want to continue to use your K-Cup machine but also want to use fresh roasted coffee, you can! All you need to do is leave a short comment with your first order. They do not offer sampler subscriptions at the current time. And you can only choose between the roast but not between roasters, farms or country of origin. The Starbucks Reserve® label offers rare coffees from small farms all over the world. Their supply is so limited, you can only find them in just a few selected stores. As a member of the Starbucks Coffee Club, you receive one single-origin coffee each month. Keep in mind that the bag only holds 8.8 ounces of coffee beans. Starbucks claims on their website that the Reserve program is also there to help people in need. They support farming families with new eco-stoves or build schools, where needed. If you want to explore more of Starbuck’s commitments, visit the Community Service at Starbucks. The price of $19 is high for an 8.8 oz bag of coffee. It’s amazing how many coffee subscription services are available today. And even better, they are all a little different. 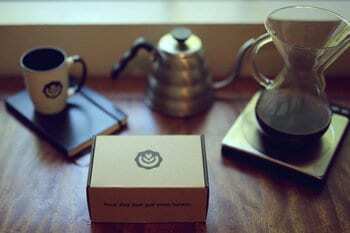 So it’s hard to say which are the best online coffee subscription services. 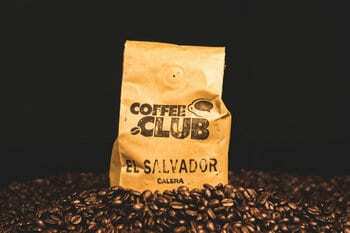 You will notice that the prices of the samples of the monthly coffee clubs above are a little steep. Samples are perfect if you don't know where to start. Explore different roasts, countries, or blends and when you found your perfect coffee, switch to a full bag subscription to save money in the long run! I hope my budget allows me to taste test them all so I can provide you with in-depth reviews. Let me know in the comments section below what coffee of the month club you have chosen! Which club do you personally subscribe too? for the last 5 months, I have been subscribed to crema.co! Sooner or later I will try the others as well, but at crema.co I just have so many options and I love to hang out on their website. Check it out yourself. You will like it!